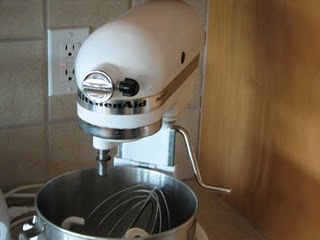 My favorite kitchen tool is my Kitchen Aid Mixer. I received this as a wedding gift almost 14 years ago. I has made my life in the kitchen so much easier. From making cookies, to cakes, to breads. It is so much easier when you have a tool like this. I know this is not in everyone’s budget but if you can someone day get one it is a tool you will use a lot. For more great tool ideas see lifeasmom.com. did you fix the link? thanks! i(and my brother) LOVE mine and bought my mom the kitchen-aid food processor for mother’s day. She was terribly excited. Someday I will get the mixer for her too. Love mine, too. Though white is a much better color choice. I got black and it shows dust and flour immediately. Thanks for posting. My favorite thing too. I can’t picture cooking without it! They have so many pretty colors of the stand-mixers today too. I would like one some day, my arm gets tired mixing dough! I have to take breaks.